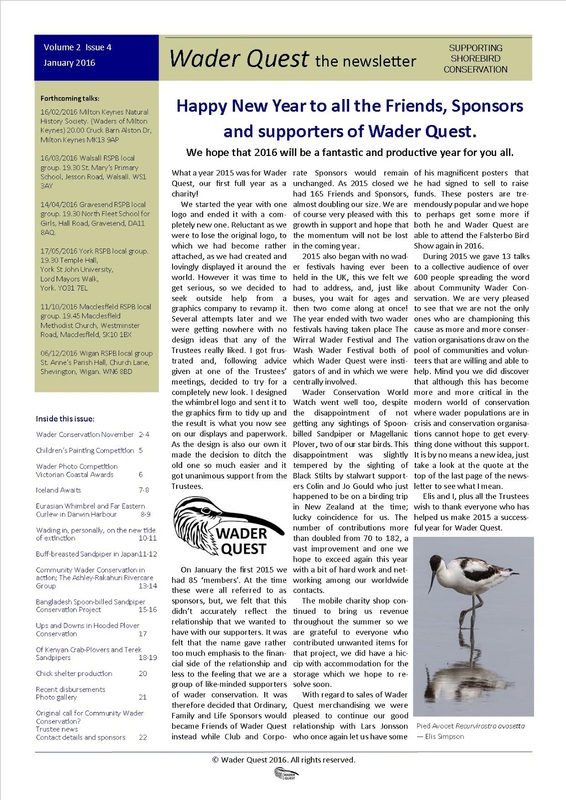 Every three months Wader Quest publishes an e-newsletter, within it, as you would expect there are details about our activities and about fundraising and disbursement of those funds. 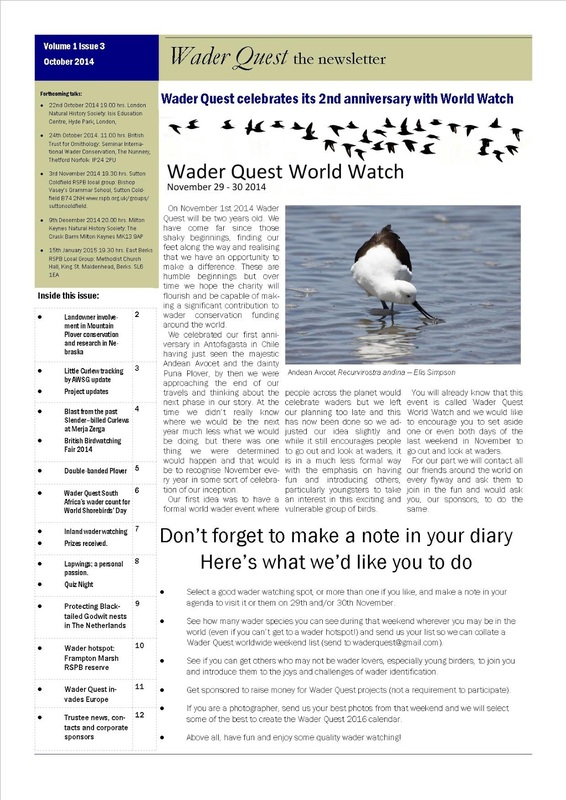 These newsletters are primarily for the interest and enjoyment of the Friends of Wader Quest and our Sponsors and supporters. So far there have been two volumes each of four issues and one special edition. 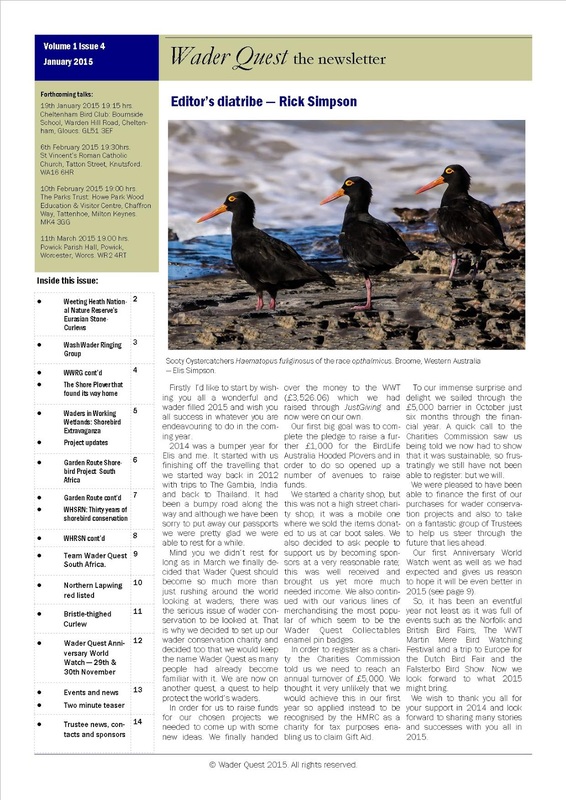 What sets the Wader Quest newsletter apart from others of its kind is the high quality articles that have been written especially for us to publish by people involved with waders in a variety of capacities around the world. 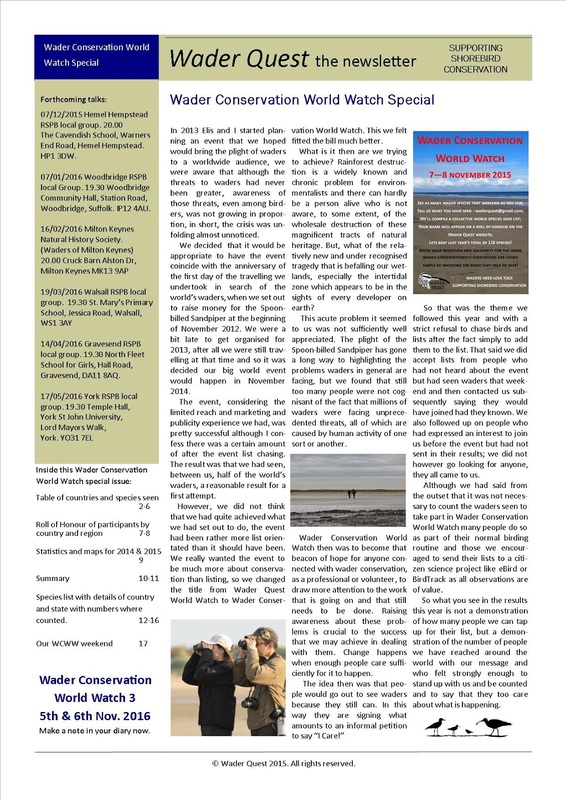 There are articles about wader watching hotspots, some famous, others are better kept secrets, there are personal accounts of wader experiences, many articles about Community Wader Conservation projects and research projects that are being carried out across the world. If you feel that you have something that you would like to contribute to future issues, please feel free to get in touch with us at waderquest@gmail.com or, if you are interested in seeing any of these articles or newsletters, then for as little as £5.00 a year you can become a Friend of Wader Quest and we will send you any, or all of the back issues you require and, of course, all future issues for as long as you remain a subscriber as a Friend or Sponsor of Wader Quest. The incredible E7 [Bar-tailed Godwit] - Rick Simpson. 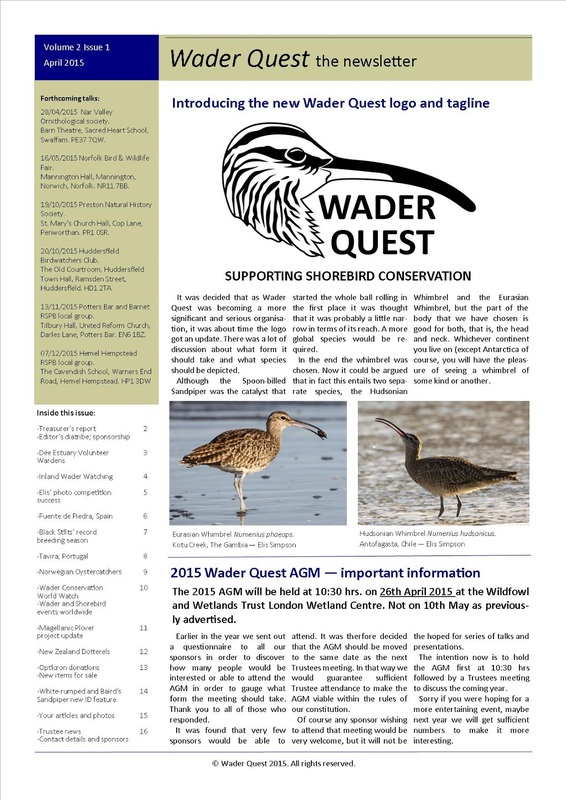 Wader Quest in southern Africa - Sue Oertli. Spoon-billed Sandpiper captive breeding programme - WWT conservation breeding team. Black Stilt and Shore Plover captive breeding programme, NZ - Sabrina Luecht. Little Curlew tracking project - Australian Wader Study Group (AWSG): Inka Veltheim and Clive Minton. The Gauteng Wader Challenge, South Africa- photographing waders within a 100km radius - Sue Oertli. Little Curlew tracking project - AWSG: Inka Veltheim and Clive Minton. Blast from the past: Slender-billed Curlews at Merja Zerga - Ashley Banwell. Double-banded Plover - Nicolas Dillon. Wader Quest South Africa’s wader count for World Shorebirds’ Day - Sue Oertli. Lapwings; a personal passion - Rick Simpson. Protecting Black-tailed Godwit nests in The Netherlands - Astrid Kant. Wader hotspot: Frampton Marsh RSPB reserve - Toby Collett RSPB warden. Norfolk Wildlife Trust Weeting Heath National Nature Reserve’s Eurasian Stone-Curlews - Darrell Stevens. Wash Wader Ringing Group (WWRG) - Ruth Walker. The Shore Plover that found its way home - Rick Simpson. 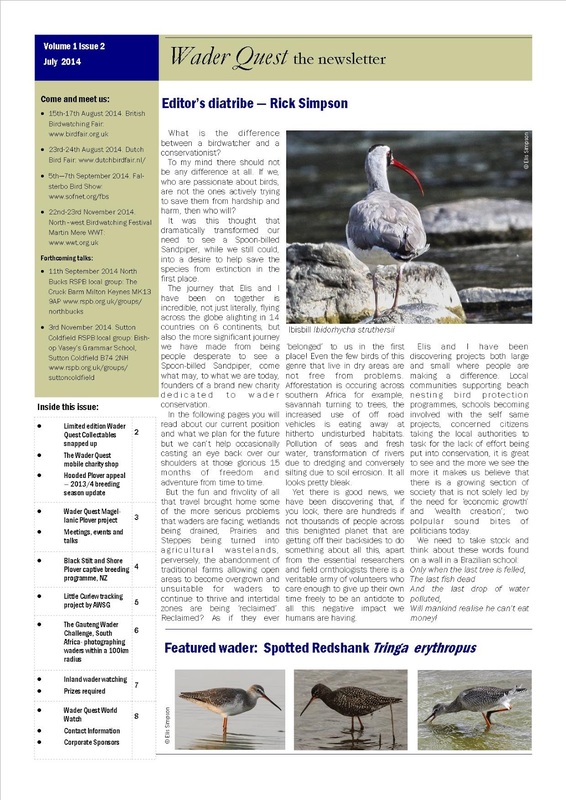 Waders in Working Wetlands: Shorebird Extravaganza 29 April – 5 May 2015 - Donna Dittmann and Steve Cardiff. Garden Route Shorebird Project South Africa - Selena Flores. WHSRN: Thirty years of shorebird conservation throughout the Americas - Rob Clay. Team Wader Quest South Africa; in search of the last few waders of 2014 - Sue Oertli. Northern Lapwing red listed as a bird of highest conservation concern - Rick Simpson. Dee Estuary Voluntary Wardens - Dr Karen Leeming. Fuente de Piedra, Andalucia, Spain - Peter Jones. Record breeding season for kakī/Black Stilt - Liz Brown: Department of Conservation Te Papa Atawhai, New Zealand. A Patch in the Sun; Salinas, Tavira Portugal - Tony Bannister. Norwegian Eurasian Oystercatchers on the Wash - Ruth Walker. Magellanic Plover Project update; first birds ringed - Rick Simpson. New Zealand Dotterel, Tūturiwhatu - Mikey Watson: Gems of Aotearoa. New feature for Baird’s and White-rumped Sandpiper ID? - Rick Simpson. Bad news from the Little Curlew tracking team - AWSG: Inka Veltheim and Clive Minton. Waders with the power to inspire - Oliver Simms. Portbury Wharf Nature Reserve, Portbury, Avon, UK - Bernie D’Arcy. The amazing tale of the third Hudsonian Godwit for the UK and its US counterpart - Rick Simpson / Gregg Gorton. The Birds Count; And So Do We - Becky Bowen: Save Our Shorebirds. Eurasian Curlews in the Peak District, UK - Kim Leyland. The Legend of the Hakawai [Campbell Island Snipe] - Mikey Watson: Gems of Aotearoa. Drone donation goes to a new home in the Netherlands - Rick Simpson. Waders : A poem by Mya-Rose “Birdgirl” Craig. Waders Of Cudmore Grove, Essex, UK - Dougal Urquhart. Finding the feeding grounds of Giant Snipe in Brazil - Lee Dingain. 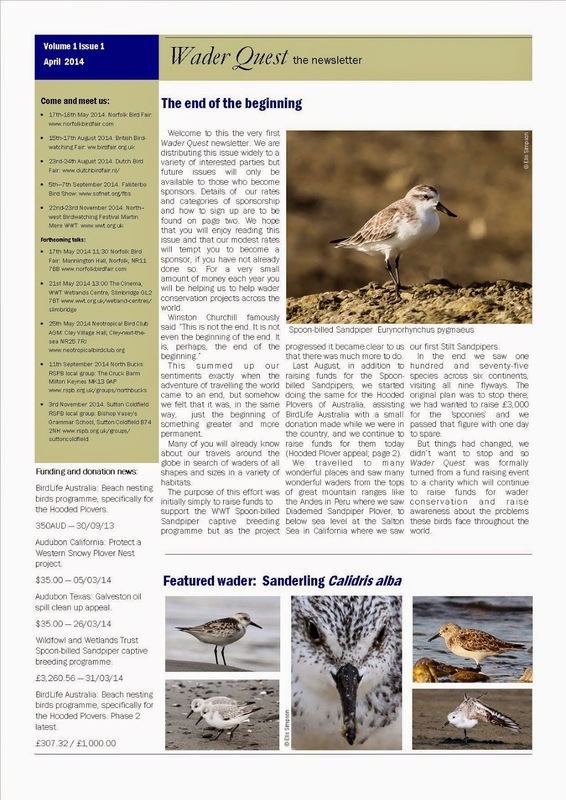 Global Flyway Network; 2015 season in China - Adrian Boyle. 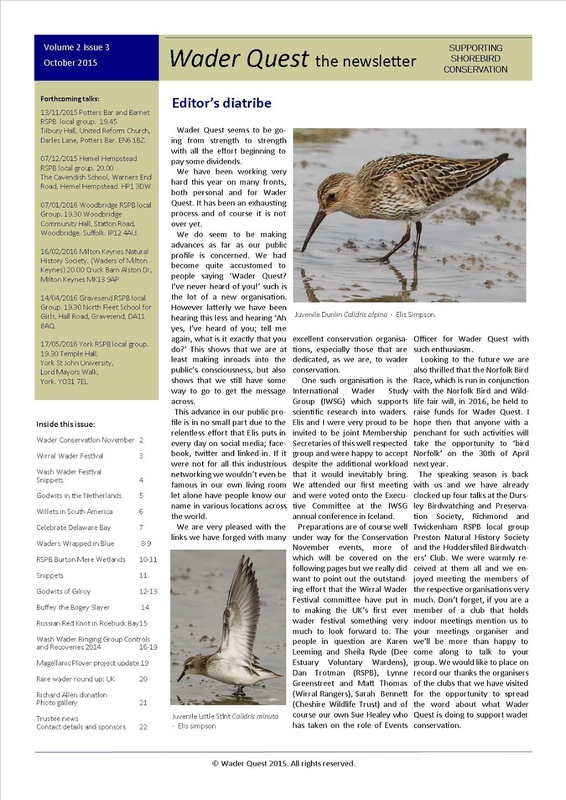 UK Wader Summary April-June 2015 - Oliver Simms. Wader Conservation November/Wirral Wader Festival/Wash Wader Festival - Wader Quest team. Some snippets about wader populations - Elis Simpson. 2015 Black-tailed Godwit update from the Netherlands - Rick Simpson. Willet Status In Southeastern South America - Natalia Martinez Curci & Adrian Azpiroz. Celebrate Delaware Bay: Taking Action on the Delaware Bay - Laura Chamberlin. Waders Wrapped in Blue - Jacqueline A. Cestero. A slow-burning Autumn, but Burton Mere maintains its ‘Pecs’ appeal - Dan Trotman. The Godwits of Gilroy - Richard Smith. Buffy the bogey-slayer - Sav Saville. A Russian Bird’s Roebuck Bay Stopover - Grace Maglio. Wash Wader Ringing Group controls & recoveries highlights 2014 - Steve Wakeham. 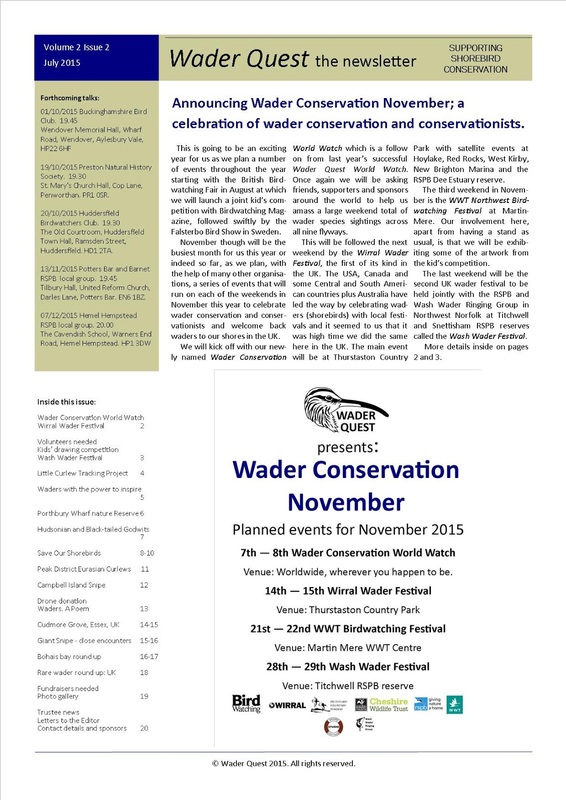 Wader Conservation World Watch results. Species seen with state and country locations plus numbers where counted. Our Wader Conservation World Watch Weekend - Rick and Elis Simpson. Victorian Coastal Awards - Renee Mead. Iceland awaits - Graham Appleton. The future of suitable habitat for Eurasian Whimbrel and Far Eastern Curlew in Darwin Harbour, Northern Territory, Australia - Amanda Lilleyman. Wading in, personally, on the new tide of extinction - Mike Clear. Buff-breasted Sandpiper in Japan - Rob Edmunds. The Ashley-Rakahuri Rivercare Group - Nick Ledgard. Introducing the Bangladesh Spoon-billed Sandpiper Conservation Project (BSCP) - Sayam Chowdhury. Ups and downs of Hooded Plover Community Wader Conservation on the Bellarine Peninsula, Victoria, Australia - Andrea Dennett. Of Kenyan Crab-Plovers and Terek Sandpipers - Colin Jackson. Milton Keynes Parks Trust Youth Rangers make chick shelters for local breeding waders - Rick Simpson.